Sam Outlaw’s debut full length album ANGELENO was a high impact release doubled up with the stamina to last an awful load of plays, culminating with plenty of accolades in the superficial end of year lists. Barely eighteen months from this record getting released across the continents, the follow up has appeared in the shape of TENDERHEART. In contrast to his previous offering, the new album is firmly planted in the grower category, but with the reassuring conclusion that eventually its true value will surface. Six Shooter Records is once again the launching pad for this self-produced album which was an alternative route of music making after working with Ry Cooder on ANGELENO. The sound is once again angled in a Californian country direction, and like its predecessor, TENDERHEART is set to get most of its love from the Americana community. This thirteen track collection of original material undulates in mood and tempo, anchored by a song that does have instant impact credentials, even if the whole album requires a few plays. An initial digital listening to this record shuffled the tracks in alphabetical order and the jaw dropped when ‘All My Life’ landed on this listener’s ears first up. This up tempo classic country number possesses all the aura of an influential Gram Parsons recording and immediately staked a claim for one of the songs that will shape 2017. When eventually the album was re-arranged in its intended order, this standout landmark track sits at number ten, with the new opening few songs getting things off to a more passive beginning. 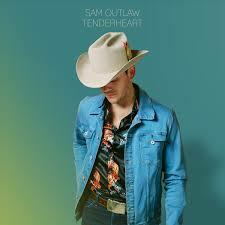 As you would expect from the singer-songwriter tradition, this is a record demanding intense lyrical listening and Sam Outlaw is not going to let folks down looking for this aspect of his music. An interesting lexicon choice exists in the early part of the record as ‘Bottomless Mimosas’ and ‘Bougainvillea, I Think’ are amongst a trio of tracks that set out introducing the album rather than pushing its summit. Four tracks in and the title song raises the impact with ‘Tenderheart’ getting full marks for emotive appeal. Humour and irony were always going to play a part in a Sam Outlaw album and ‘She’s Playing Hard to Get (Rid Of)’ ticks this box as the album reaches its mid-point. Apart from the aforementioned standout track, the second part of the album flickers on the appreciation horizon without fully leaving an awe impression. ‘Dry in the Sun’ scores high on melody, while album closer ‘Look At You Now’ is perhaps as low key as the opener ‘Everyone's Looking For Home’. A full list of musicians appears on a record that is far from sparse on the production front. Taylor Goldsmith of Dawes plays guitar alongside Danny Garcia who toured with Sam when he made his UK debut last January in support of Aaron Watson. Frequently, input from the pedal steel and organ spice up the sound adding to the record’s sonic appeal. Time will tell the eventual heights that TENDERHEART will scale with its undoubted potential to ascend over the duration of a year. Maybe another UK visit to aid the promotion will expose more light on this set of songs; the live arena has a tried and tested experience of breathing fresh life into an album. Sam Outlaw now has an outstanding and a solid release in his locker since hitting the recording world with renewed vigour. One thing for certain, there is much more to come from an artist who has a keen ear on making a style of music that will always get well received here.